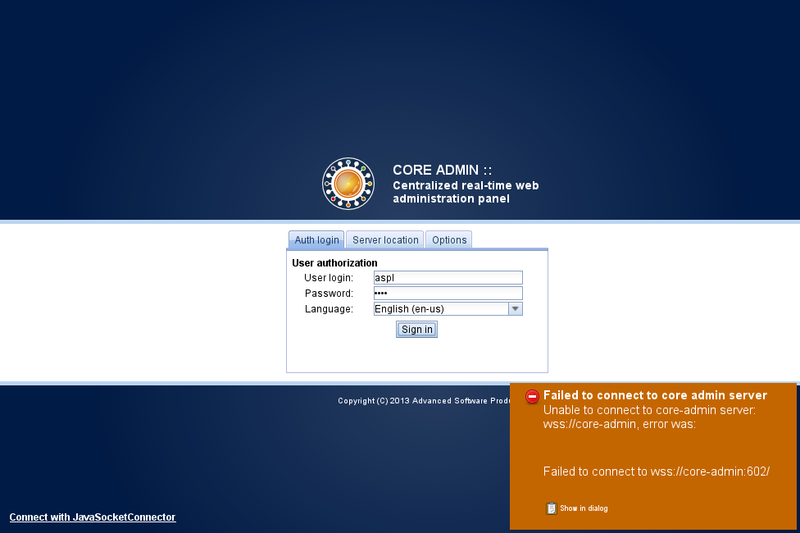 How to see my Core-Admin license and check its status? To see your current Core-Admin License codes, you must be log into Core-Admin as platform admin, and then click on the top menu System → License manager. This will launch the License manager application. 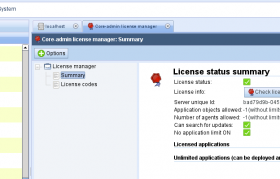 Then click on “Summary” and it will display current license status. If for whatever reason your Core-Admin server wasn’t able to check current installed license codes, you can trigger a check by clicking on the “Check license now” button which appears inside the Summary section. Under the the “License codes” section (on the left side tree), you’ll find currently installed license codes. There, you’ll be able to list license codes and to remove them. To add a new license code, just click on Options (located at the top toolbar) → Add license code. Then introduce the license code and wait for server confirmation. Core-Admin Web Edition: what is included in the license? Support to accept one agent connecting to this server. More agents can be added by acquiring more Core-Admin Single Agent or similar subscription licenses (see options). Support to create any kind of core-admin users and delegating permissions to them. This is crucial for any situation where users must have low level permissions to administrate only those objects that they need. Support to run any number of the Core-Admin base applications on any connected server. Support to run one instance of Webhosting management, Mail Admin, Dns Admin and Shared FTP manager. Support to get updates (security, critical and upgrades) at any time, without any limit. Support to create any number of objects without any limit (mail plans, webhosting, etc..). There are other elements that are allowed by this subscription license but these are the most relevant. Contact us if you have any additional question. Core-Admin Free Web Edition: what is allowed commercially with this license? You can use Core-Admin Free Web Edition subscription license for any commercial or private use, even for selling hosting services using Core-Admin. The only difference is that it limits the number of objects (web hostings, mail plans) and it also places some restrictions about the kind of core-admin users can can create (to name some). In the case you have a private or corporate server and you want to manage your organization’s web pages with Core-Admin, and without considering the purpose of those web pages, then you can use Core-Admin Free Web Edition. Core-Admin Web Edition: what license subscription do I need for several servers? Independent servers: if you want to separate those servers making them to have independent administrations panels, you need one Core-Admin Web Edition subscription license for each server. One panel, various servers: in the case you want to have a single panel controlling these servers, you need a single Core-Admin Web Edition subscription and one Core-Admin Single Agent subscription for each server you want to connect. In the case you want to have separate services in each server, for example, one server runs web services, other mail services and other dns services, you don’t need anything else because Core-Admin Web Edition includes support to run a single instance of all of those applications. In the case you want additional applications you need to acquire a Core-Admin Standard Application subscription and indicate during the purchase process which application you need. In the case you want all servers connected to a single central server but you still need to run all applications (dns, mail, web…) in all of them, it is cheaper to acquire one Core-Admin Web Edition subscription license for each of those servers instead of acquiring separate application. 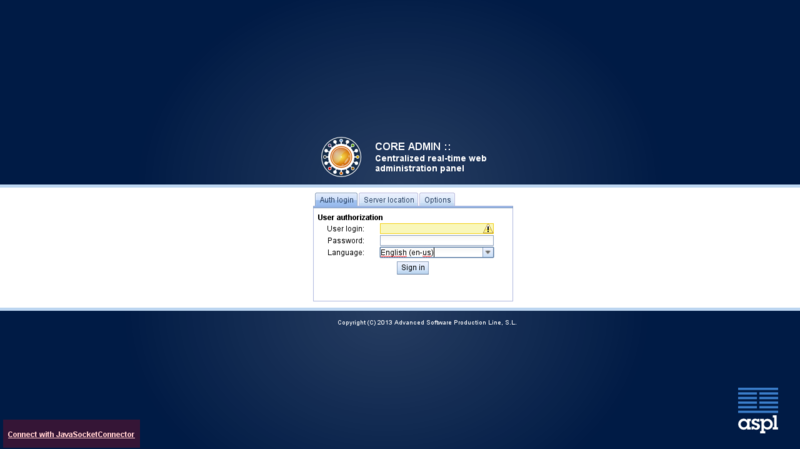 Core-Admin provides a web panel interface to administrate and monitor services, applications and machines. To get a real-time interaction between users and these machines’ services, Core-Admin takes advantage of BEEP (Block Extensible Exchange Protocol http://www.beepcore.org). However, BEEP is based on TCP/IP and this protocol is not available “as is” in the current web browsers and it is not likely to be in the near future. For that, Core-Admin uses two methods (and there may be more in the future) to enable TCP/IP availability (in fact, something similar), so your browser can talk “BEEP” with the central server it is trying to connect to. WebSocket: if the browser has support for this new technology, it will be the default choice. JavaSocketConector: otherwise, Core-Admin will use a java applet to enable TCP/IP access. All modern browsers (those comming out since 2010), including Internet Explorer 8 and so forth, includes support for JavaSocketConnector. In fact, any browser that has support for Java will have support for JavaSocketConnector. In the case your browser does not support WebSocket, Core-Admin will detect it and will enable JavaSocketConnector interface without making you to pay attention to this detail. In both cases, using WebSocket or JavaSocketConnector, your core-admin client will attempt to connect through the 602/TCP port. Therefore, be sure there is no firewall blocking that internet connection. To get a TLS/SSL certificate signed by a known party. It is by far the easiest solution and it is also the recommended way in the case you expect to provide access to general users (for example, for webhosting services), but it involves a cost for signing the certificate. Core-Admin users have especial prices for certificate signing, see next: core-admin certificates. To use JavaSocketConnector which doesn’t suffers from this problem. Create a browser exception to allow this connection. It is really important to pass the right server name (the one provided in the installation) to make it match with the url access. Requires signed certificate when using WebSocket? Can be added an exception while using WebSocket? To be able to manage currently blocked IP you need a machine administrator or platform admin user. Inside that application you’ve got on the left side currently blocked Ips section. Click on it “Blacklisted IPs” (3). This will show a new form where we have to indicate the IP to block (5). It is also recommended to write a comment about the blocking (why or event it) so you can better identify this later. 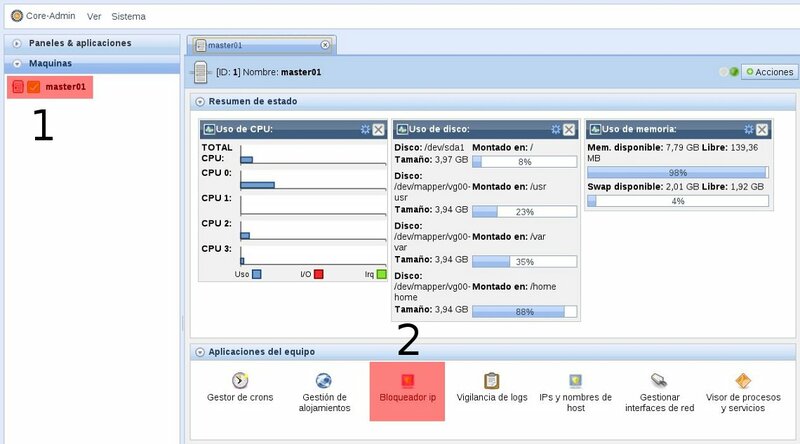 We have to also choose between permanent or temporal blocking (6). If you select temporal blocking, we have indicate for how long we want it to be blocked. If you click on the icon, you’ll see various references to time equivalences. Then, please to “Add a new Blacklisted ip” (7) at the bottom to save changes. To remove an IP blocked we have to click on the Blacklisted IPs (3) section (on the left panel) as we did in previous section. After that, a new window will show up allowing to manage this IP blocked record. Then we have to click on “Remove blacklisted IP” (5). 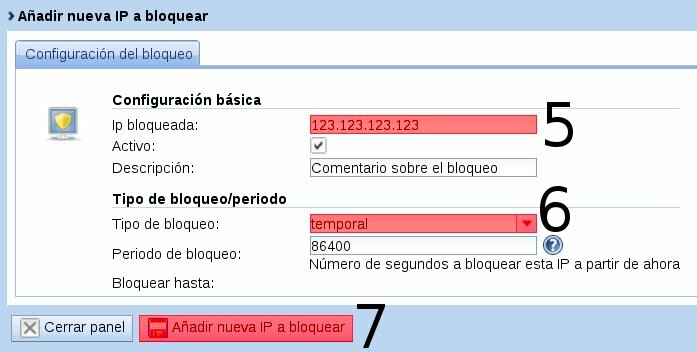 Another useful option we have available with ip blocker tool is the blocking exception. This will allow us to manage which IPs shouldn’t be blocked automatically due to security processes that are automatically activated by Core-Admin or applications using blocking services from it. To add a blocking exception is pretty straightforward. 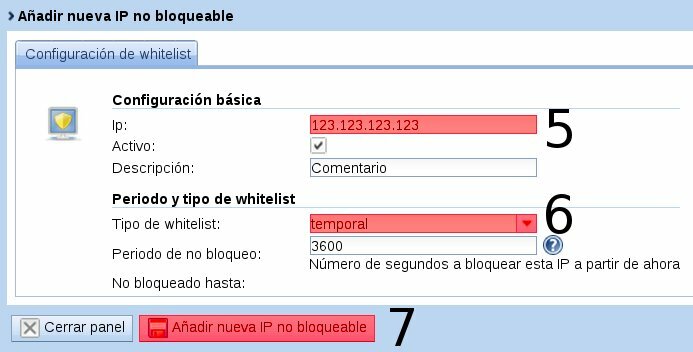 Once we have launched the IP blocker application, (steps 1 and 2), we have to click on “Unblockable IPs”(3) and then click on “Add whitelisted ip” (4). A new window will appear where we can fill the details about the IP that mustn’t be blocked even when requested. We provide the IP at (5). It is really recommended to provide a comment or an event id to better identify this record later. We also indicate the kind of record: permanent o temporal (6). Once finished, click on “Add a new whitelisted Ip” (7). IP blocker application includes a shell script and a Python interface that allows other applications to trigger blocking operations in a manner that is consistent with the platform and with the advantage that all these blocking operations can be managed through the core-admin interface. Feel free to contact us if you have questions or doubts while using Core-Admin. Use the following contact information to reach us.